As part of the “tool kit” put together by Commissioner Elia and the NYSED, schools have started to distribute this flyer in an effort to coerce parents into participating in the 2016 Grade 3-8 Math and ELA tests. Much of the information provided is true: but plenty of information has been conveniently omitted from this flyer as the Commissioner continues to try to deceive the public into thinking that these “changes” will benefit children. Parents are not appeased because the bottom line is as such: testing still dominates their child’s educational experience. 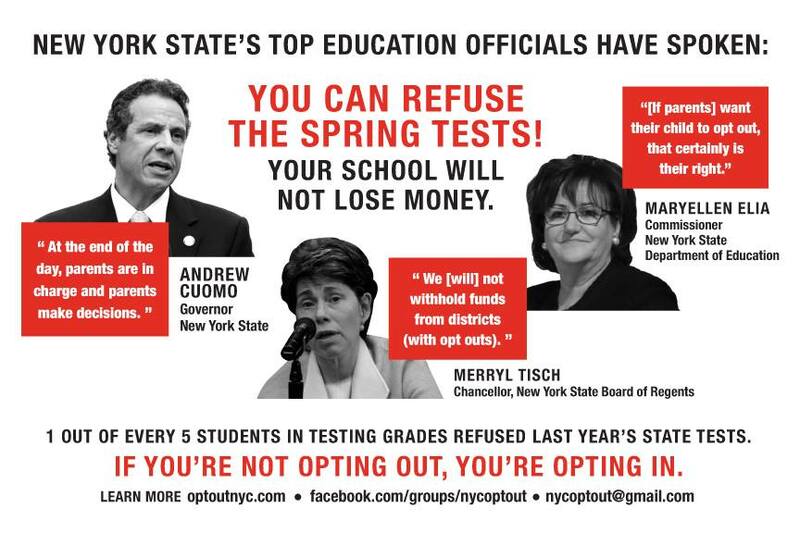 Let’s take a closer look at what NYSED “forgot” to mention and it will be easy to see why parents will continue to opt out of testing this spring. In reality, tests are still excessively long. 8-year-old children will be tested for over an hour for 3 consecutive days for ELA and repeat that schedule the following week for math. Students with IEP/504 extended time accommodations could be working twice as long. Eliminating a few questions is certainly NOT the change that parents are looking for. Asking a child to take more time to finish an exam is not a solution to the test and punish agenda. In fact, the decision to allow the testing experience to be “untimed” only exacerbates the stressful situation that children are put in when faced with a developmentally inappropriate exam with high stakes consequences attached. Not only is it wildly inappropriate for children to spend this amount of time on testing, this move by NYSED creates a logistical nightmare for schools who will now be forced to reorganize already limited resources to oversee testing. NYSED has even provided guidance regarding procedures for allowing students a lunch break during testing. So in the end, more staff will be used to accommodate the untimed testing and police test takers during their lunch break (so they can’t discuss the test) while the rest of the student population is underserved and instructional time is lost. This is most certainly NOT a positive change. This is not a change at all. Teachers have always been “involved” in the test-making process in New York State and more about that process can be read here. What’s important to note is that both in the past and at the present time teachers are not creating the assessments-a for profit corporation is creating the tests. According to the NYSED document pictured above, in October 2015, teachers were called to Albany to “… evaluate and select questions for the 2016 tests.” Moving forward a “greater number” of teachers will be “involved” in the “review” of tests. This does NOT mean that teachers developed or created the 2016 tests, it means that teachers were asked to select from questions provided by a corporation. It is very clear that questions written by NYS teachers will not appear on a test until 2018! The NYSED did not renew its contract with Pearson and did hire Questar, Inc to develop the assessments BUT the Pearson contract with the state remains until June 2016 and Questar’s does not begin until July 2016. Testing materials put out this year will have the Questar name/logo visible but the items within the test were developed by Pearson, in large part because Questar has not yet developed or field tested a bank of question to use on NYS grade 3-8 exams. While we’re on the topic, why not look at a few other reasons that the Commissioner or school official might use to try to coerce parents into participating in tests. 1. Teachers are no longer evaluated using state tests. False. The state tests will not be used to develop a performance rating under the current Annual Professional performance Review but will be used to provide an advisory score. The score will not be used for hiring/firing purposes during the moratorium, but it is certainly possible that when the moratorium is over the advisory scores could be used for hiring/firing. No one at NYSED will provide parents, teachers, or administrators with clarification in regards to the possibility of a “look-back”. Furthermore, it is now widely accepted that it is bad practice to use student test scores to evaluate teachers and parents know this. Shifting a bad idea from one test to another is NOT the change parents are demanding. Refusing to participate in state and/or local tests used to evaluate teachers has proven to be the most effective way to advocate for our kids and parents will continue to do so until their concerns are truly addressed. It’s very true that kids take tests on a regular basis but this is certainly not a valid reason why kids should take part in a state exam. If our kids are taking tests weekly, then the teachers and parents have the information necessary to inform instruction and make sure the child’s needs are being met. In many districts, children are over-tested in the classroom because the statewide test and punish agenda has created a data driven culture that ignores the whole child and focuses solely on numbers and scores. Many parents refuse to participate in NYS grade 3-8 exams because they feel that their action sends a message that they are not in support of the over emphasis on testing-local or state. 3. NYS Tests are one of many measures used to test the rigorous CC Learning Standards. Misses the point. Parents have and will continue to reject the notion that a standardized test is the only way in which learning can be measured. Alongside teachers and principals who feel the same way, parents are demanding that the focus return to educating the whole child as opposed to preparing children to take a test. The sentiment that a test is only one way to measure learning rings hollow with parents who see-every day-that their child’s needs are ignored while the test is placed at the forefront. 4. Refusing tests could harm our school. False. Participating in tests shows that we as parents, students, or teachers, are complicit with sorting and ranking schools which is why opting in to such a system is certainly not the answer. It is only by rejecting the flawed system that we can truly protect our schools. Want to be sure you don’t risk harming your school? Refuse to participate. It is only when you opt in to the system that you take a risk. 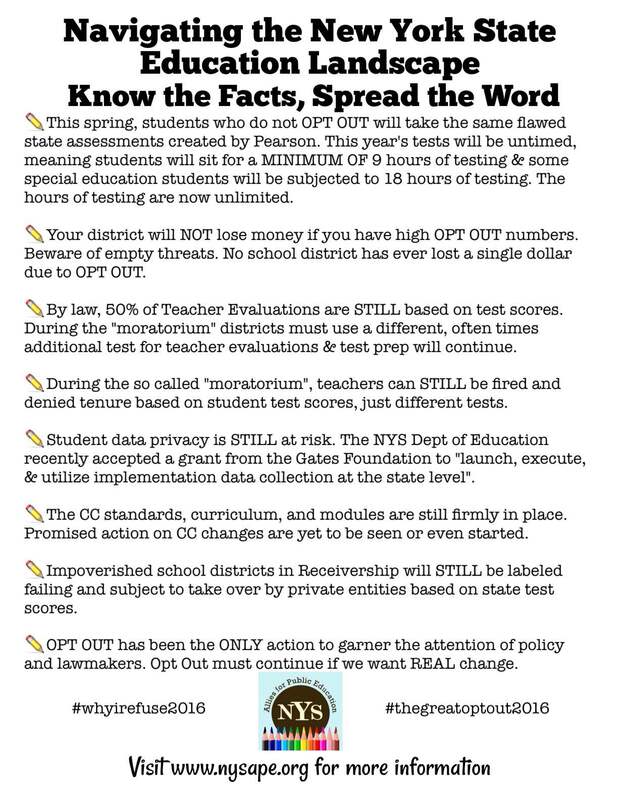 Opt OUT and you aren’t a part of the broken model. And just in case anyone wants to try this old trick, please know that no school has ever lost funding due to low participation rates. New York State Allies for Public Education has a great resource for explaining participation rates and federal Title I funding but you don’t really need to know the fine print to be reassured that your refusal won’t cause harm. You, as a parent, have the right to oversee your child’s education. You, as a parent, have the right to refuse to participate in testing. If the state or federal government, or the Governor of NYS wants to deny your school funding because you expressed your right as a parent, call their bluff. It is NOT you who will be harming the school, it is the people in positions of power that can choose to harm your school. 5. Concerns expressed by parents last spring have been addressed. False. Parents’ concerns have certainly NOT been addressed. Ask a parent and they will tell you that last year and this year feel quite the same. Their child has advanced a grade, but their child is still given pre-tests and post-tests, modules are still in place, curriculum is still paced based on the NYS testing schedule, and there has yet to be a return to child-centered instruction alongside rich, robust programming for all students. And parents have not forgotten: the Education Transformation Act of 2015 is still on record. It remains the law. A moratorium does not equate to change. A moratorium means a pause, and this pause means that the damage will resume-unless, of course, parents continue to reject the entire premise by opting out of the tests.